Mackenzie Collett, left, and Mallorie Watts, right, attorneys on the Delaware Hayes mock trial team, listen as one of their witnesses and teammates, Jackson Collins, on the stand, is cross examined by another team. The teams competited in several legal battles and had to represent the case from both sides. 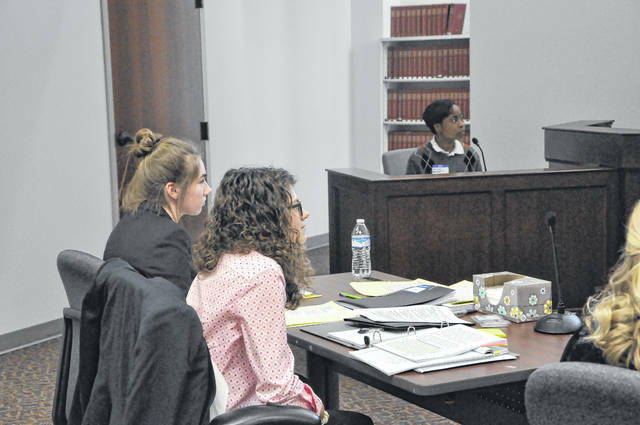 Students from Delaware Hayes High School joined peers from six other schools and spent Friday engaged in fierce “legal battles” during the 2018 Ohio High School Mock Trial Competition at the Hayes Building in downtown Delaware. Hayes senior Mallorie Watts role-played as an attorney during the event and said she signed up for the competition because she did mock government and was curious about seeking a career in law. The competition involved a courtroom-like setting with testimony, objections, and panels of judges, played by local attorneys. “I don’t think I want to do law. It’s a little intense,” Watts joked. Watts and her “co-counsel” Mackenzie Collett said mock trial is a course or a club with school funding at many other schools they competed against, but the Hayes team had to sell candy bars to buy the course materials, which meant they were getting them months after the other teams. Collett said she wanted to be an attorney from a very young age, but changed her mind in fourth grade, when she decided she wanted to be an appellate judge. Collett said this is her first time doing mock trial and said she was very excited for the competition. Ultimately, Team “Courtroom Crew” from Buckeye Valley and Team “Gold” from Big Walnut advanced to the next round of competition and will compete again at the regional competition on Feb. 16. The state finals are on March 8-10 in Columbus. Delaware City Attorney Darren Shulman served as a judge for the competition and said he agreed to be a judge for professional and personal reasons. As a judge, Shulman has to hear objections from both teams and guide the competition.